Historical records suggest bison were numerous in southern Indiana, but their remains are very scarce. Only two archaeological sites with more than a few skeletal elements reported as bison have been documented. 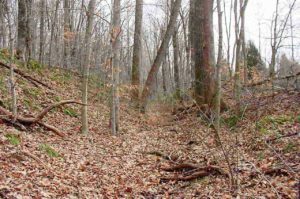 These are located near Rockport in Spencer County and their association is with 18th century Euro-American campsites established on the river bank. There are only a few scattered elements of bison bone identified from Mississippian period Caborn-Welborn phase sites in southwestern Indiana and others in Kentucky. 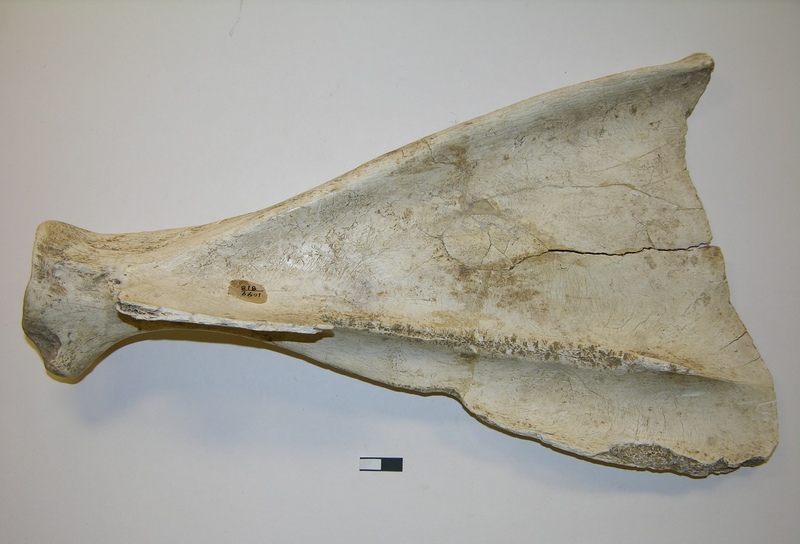 There are also a few bones identified as bison from Oliver phase sites and some of them were modified into tools. The hoe made from a bison shoulder blade at left was found at an Oliver phase village in central Indiana. It is heavily worn from use on the broad end. A bony ridge has been mostly chipped away to tie the blade to a handle. So far, we have no evidence of prehistoric bison kill sites in Indiana or the surrounding region. Dried meat, hides and bones for tools could have been readily traded far from sites where bison were killed and butchered. A major problem is that the skeletons of modern cattle, oxen, and bison are difficult to distinguish without skulls and other key elements. In addition, when skeletons are incomplete and fragmentary, the individual bones of elk and other large game can be also confused with bison. 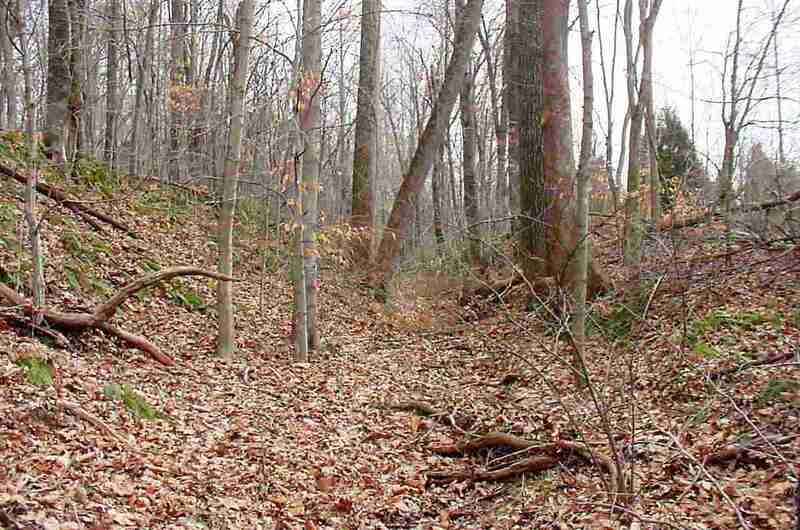 In the view shown here of a surviving section of the Buffalo Trace, now heavily forested, countless animals, prehistoric people, soldiers, American settlers, and travelers passed through southern Indiana using this natural road through the wilderness. 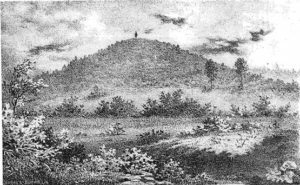 A place of interest to early settlers related to Native Americans which was noted by many early travelers was the Pyramid Mound site near Vincennes, Indiana. It was originally described by Collett (1874) as being oblong, about 300 feet long, with a level area on the top (see photo from 1874 with the figure of a man at the top of the mound). The mound is decently preserved, as no systematic archaeological investigations have taken place at the site. Patton (1874) performed some limited excavations in 1874, which led to the discovery of Native American burials. Due to the lack of excavations at the site, very little is known about the people who used the mound. It is thought that the site dates at least to the Mississippian period, based on a single Yankeetown pottery vessel. Despite its natural origins, Pyramid Mound is an important archaeological site, and was listed on the National Register of Historic Places in 1975. It is the center of Park called Sugar Loaf Mound State Historic Site operated by the Knox county Parks and Recreation Department. Collett, John, 1874 Geology of Knox County. Geological Survey of Indiana, 5th Annual Report, p. 373. Indianapolis.